there is a feature beginning on page 86 of the current issue of rapha's twice yearly journal, mondial, concerning the design and manufacture of fast clothing. given that a substantial proportion of the aerodynamic drag acting on a bicycle plus rider pertains to the latter, it is surely not unseemly that those at the cutting edge will seek to minimise this effect as much as possible? however, at that particular point, the old enemy compromise begins to enter those mathematical equations. it may be true that the professional rider has very little say in that which he/she is provided by way of competitive apparel, but anything truly out of the ordinary, no matter how efficient, might be something of a hard sell to those of us who have to pay for the wardrobe (so to speak). of course, there will always be a group of individuals happy to suffer slings and arrows if it means they can win the club ten on a wednesday evening. as if the svelte carbon, disc wheel and tri-spoked front were insufficient to mark you out as competitive. however, i can't help thinking that this is the point at which comparison can be made between digitally downloaded music and the currently reviving trend for vinyl. let's face it, the majority of us participate in bike rides that feature, at the very least, one coffee stop, establishments hosting customers who might feel a tad uncomfortable sitting adjacent to a rider clad in a skimpy skinsuit featuring dimples all across its surface. decorum suggests that there is indeed a sartorial line which ought not to be crossed, even in the search for the ultimate espresso. though such developments in the world of cycling apparel are fascinating in and of themselves, i fear i may have entered this world around ten years too late, for i cannot deny a hankering for a wool jersey on which the sponsor's name(s) is embroidered rather than dye sublimated. 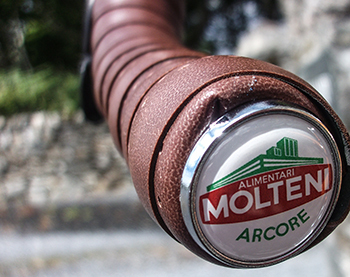 in a modern world that expects something new every day and a professional world of cycling that must append or lose sponsors' logos overnight, i can almost hear the sigh of relief exhaled when polyester gained the upper hand. 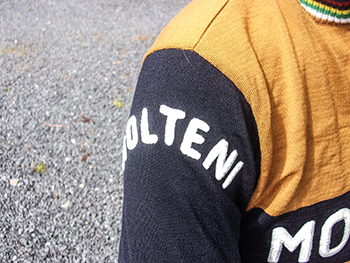 but truly, there is little more comfortable and more velocipedinally admirable than an embroidered merino wool jersey. there have been several offerings available that fit the above description ever since wool disappeared from the professional peloton, but none, i'll wager, as authentic or as attractive as the current range from belgium's magliamo. let's face it, the very fact that they originate from belgium gives them a colossal head start. 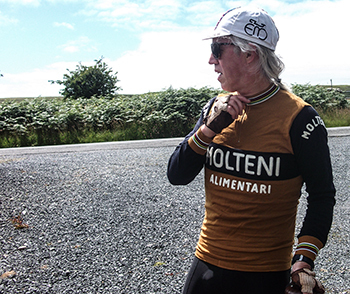 though there are several designs featured in the magliamo catalogue, i opted for perhaps the obvious by way of the black and brown molteni alimentari jersey as worn by eddy himself. lest you snigger at my conventionality in the face of exotic optionality, i had in mind that there lurks in the bikeshed a molteni coloured colnago master that surely complements magliamo's merino wool to perfection. always willing to suffer for my art. available in either short sleeve or, as reviewed, long sleeve, this is, as cyril lord once proclaimed, 'luxury you can afford'. the quality is beyond reproach, both in the jersey's construction, weight, fit and embroidery. 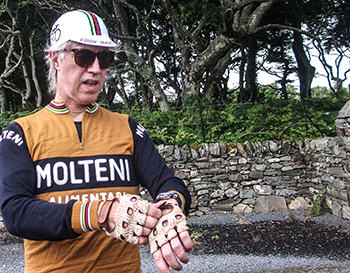 granted, i possess barely a fraction of the character described by the cannibal, but aboard the orange colnago master with a merckx casquette 'neath my helmet, i cannot deny the occasional delusion of grandeur. 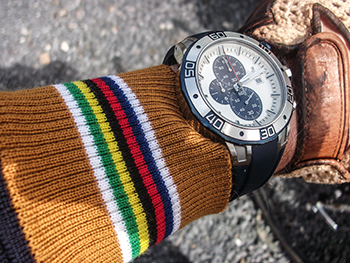 collar and cuffs feature the rainbow stripes, the former offering a good home to the quarter-length zip. 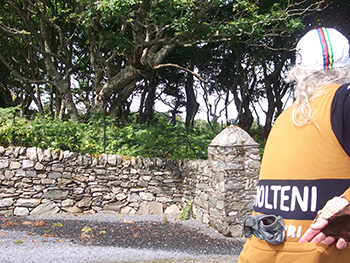 the torso length is commensurate with that of the period (ie, longer than today's shorter professional cut), but three capacious rear pockets still allow the carrying of an essentials case, digital camera, mini pump and waterproof stowaway or gilet, all this without the hem dropping closer and closer to the rear tyre. however, the open secret attaching to such wool-based luxury is not only its affectation with the halcyon days of yore, but the sheer joy of wearing it both on and off the bicycle. there are several contemporary cycle jerseys in which i feel perfectly at home when sat facing a family of four sheltering from the hebridean rain in debbie's of a saturday afternoon, but magliamo's vintage molteni alimentari has a je ne sais quoi all of its very own. beauty, perfection and authenticity all in one jersey.